This past week, I’ve been taking a Saga nishiki (also: saganishiki) workshop with Mihoko Karaki. 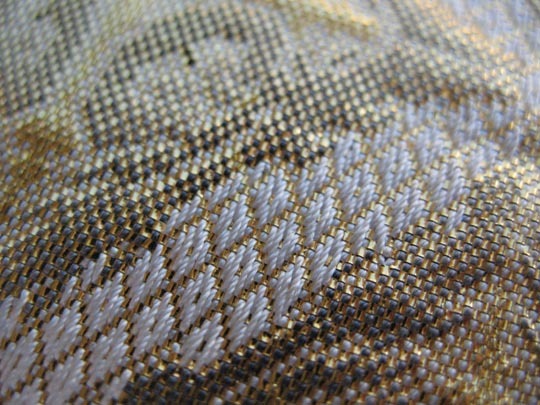 It’s a Japanese weaving technique that uses a gilded or lacquered rice-paper warp, and a silk weft. The design possibilities are AMAZING. 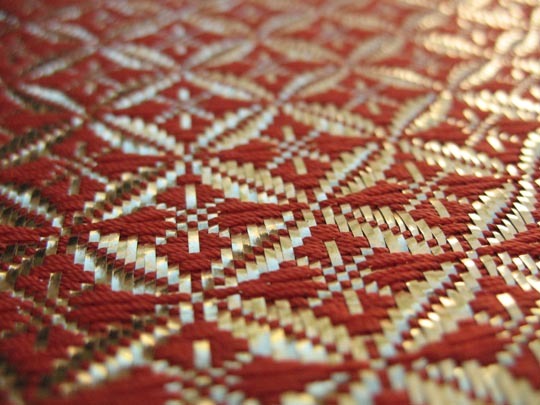 The technique is uniquely Japanese, and is used traditionally to make handbags, jewelry, obis, and special shoes. This is the words – Saga nishiki – written out in Japanese. This is a piece of Mihoko’s work. Needless to say, mine is a lot simpler – and riddled with errors in tension and beat. Although by the end of the workshop, I was getting to the point of a two-color inlay brocade design, and my beat was considerably improved. 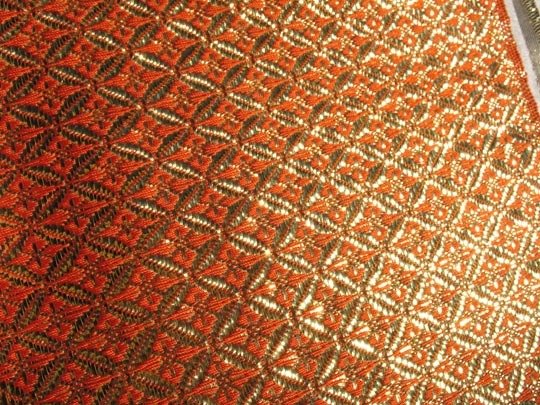 Here’s a shot of my warp – a rose-path design, before I got into the second color. Here’s me, hard at work. 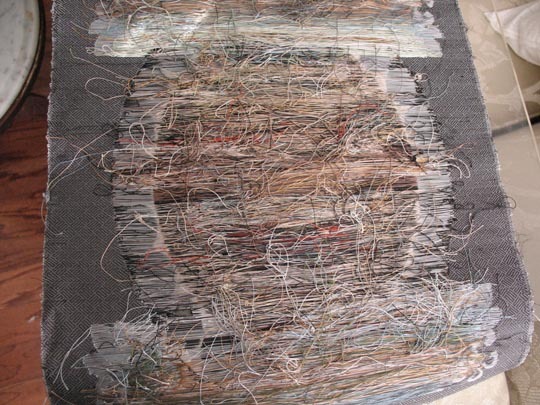 I usually work with tablet weaving silk or other fine thread at about 250 threads per inch… so when I tell you this is tedious and delicate work, you know that I know what I’m talking about. The warp really is paper. It is treated with a special laquered surface. 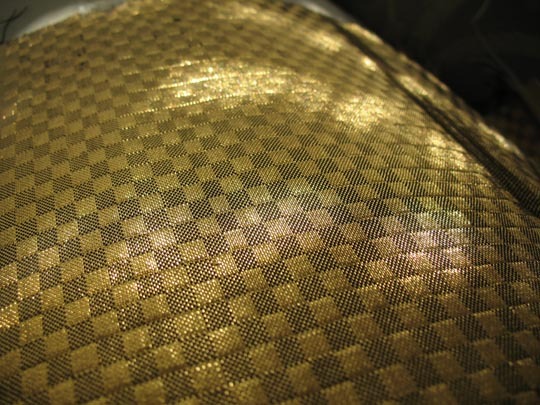 The best traditional stuff is leafed with real gold, silver or platinum. The student grade is a synthetic, but looks pretty gold-y. 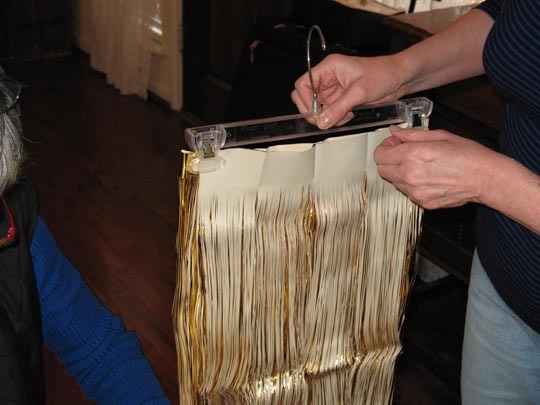 The warps are made of rice paper, and are hand-cut with a special tool. The one I’m using is 35 cuts per each 3.3 centimeters – which works out to about 25 ends per inch. 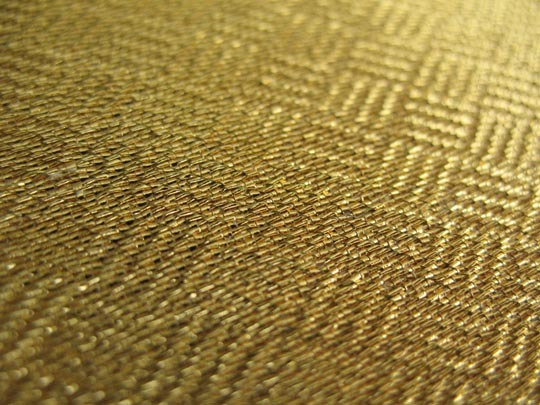 The weft is a special kind of silk; it’s a highly twisted 3-ply organzine. I’m guessing around 600 denier, for the weight I’m working with. 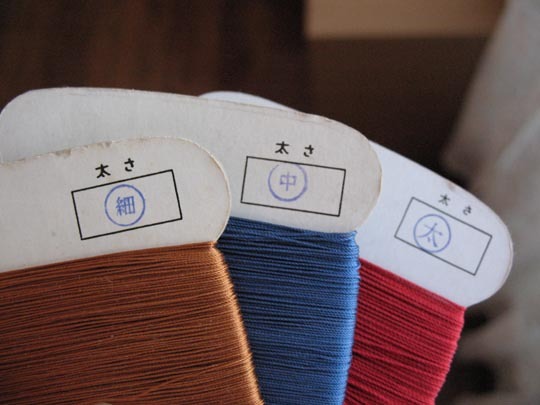 There are three sizes here; they are marked at the top with a Japanese symbol that indicates the size. I’m using the medium-sized weft, like the blue in the middle. Every once in a while, you’re reminded that it really IS paper… like when Mihoko fixes something with Scotch tape! 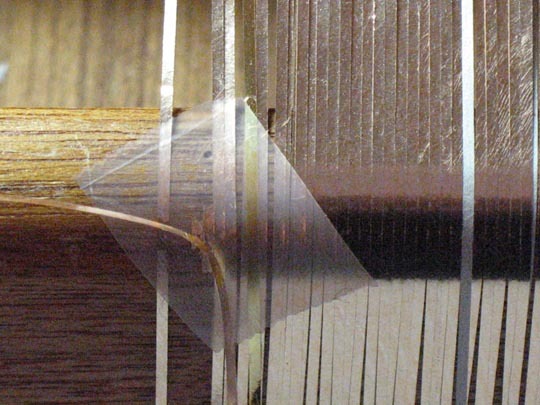 Amazingly, we only saw 2 broken warps, with seven weavers working for five days. The two broken warps were on a warp that is nearly 30 years old, so the paper is a little weaker. The beaters, shuttles, and pickup sticks are all bamboo. 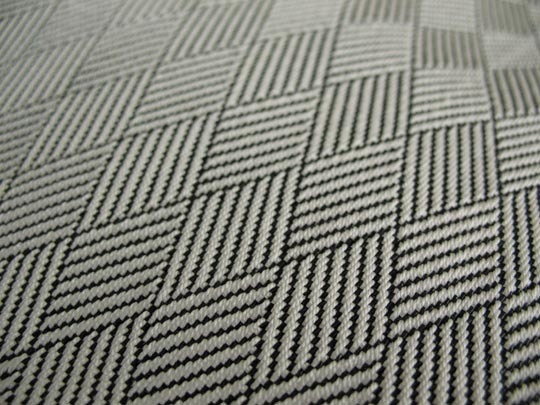 Everything is sanded and finished very smoothly, to avoid snagging the paper warp or the silk weft. Here, Mihoko is sitting at my loom, showing us how to pick up for a 3/1 twill. This flower on gold has 16 colors in it. You really can’t appreciate that fact, until you get close up. Have I mentioned lately that I love the Canon A630 that Chris got me for Christmas? 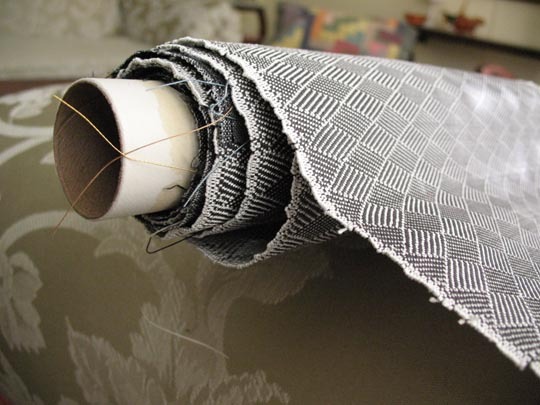 The silk makes long floats on the back, but because of the sturdiness of the paper warp, it doesn’t cause buckling. That is, when Mihoko does it. Mine kinda buckles, but it’s getting better. These are difficult to light properly for photography, because bright light tends to glare off of the gold. 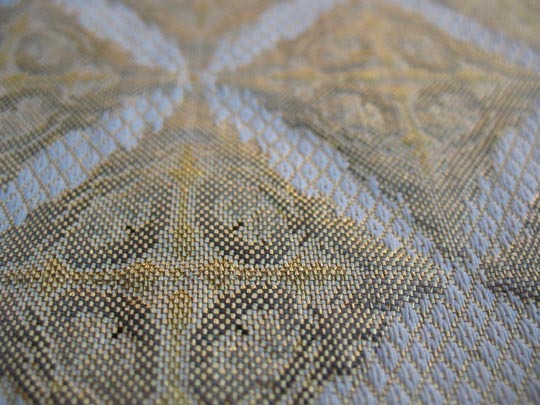 It’s amazing the sheen that comes off the warp threads in the sunlight. This piece is based on a design (on a piece of some other medium, I couldn’t figure out what) in the Shoso-in Treasure House, a museum founded in 800 AD. 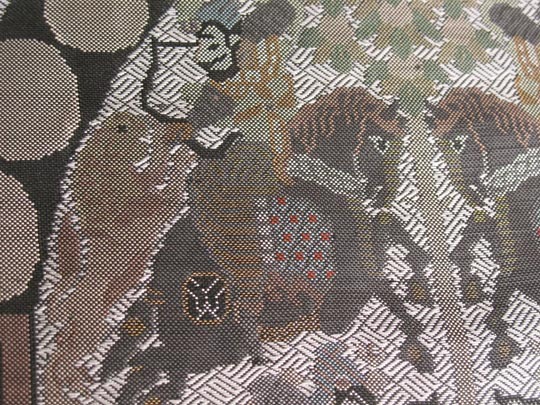 The Persian warriors are on horseback, shooting lions. 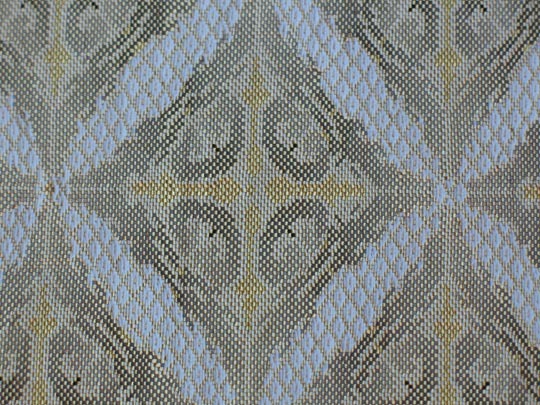 The background is this meandering twill. The back is just a dizzying pile of extra strings. Some of them appear only briefly in the surface. 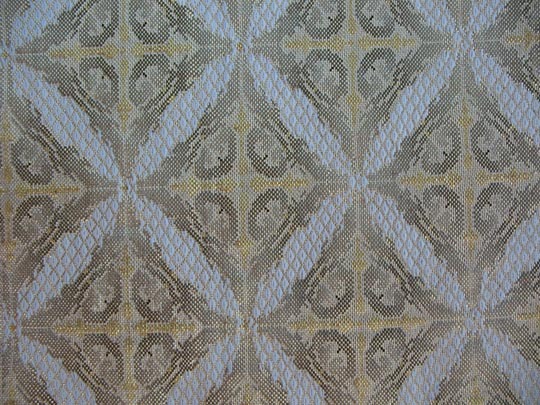 Mihoko said that in the complicated parts of this pattern, she would only be able to pick 2 or 3 rows in a six-hour day of weaving. This is absolutely amazing to see. Holy crap, I had no idea something like this even existed. It’s beautiful. wow. 250 is your usual epi?! You’re nuts my friend! That looks absolutely amazing. I’m totally jealous of your patience. and PAPER for a warp. pretty crazy I’d not thought you could do that. Absolutely gorgeous. 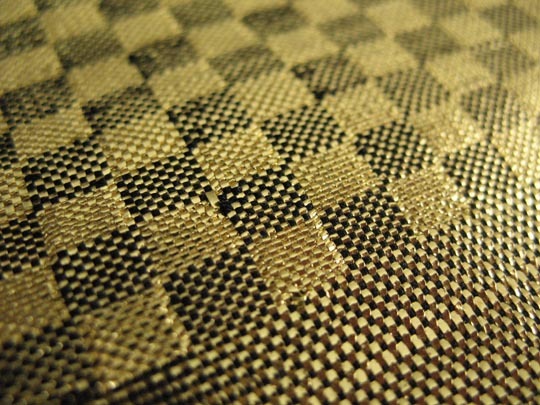 The urge to track down a handbag made in this fashion is great — and an expensive endeavor I’d wager. Hee – yup! I’ve been collecting antique fiber arts tools, for the same reason – nobody does that (here, at least) any more! Yup, 250 – 300. 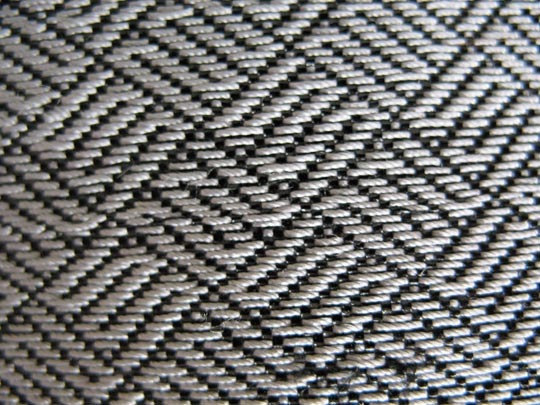 Keep in mind that with tablet weaving, a lot of that density is vertical – the fabric is thick up-and-down, not just across. 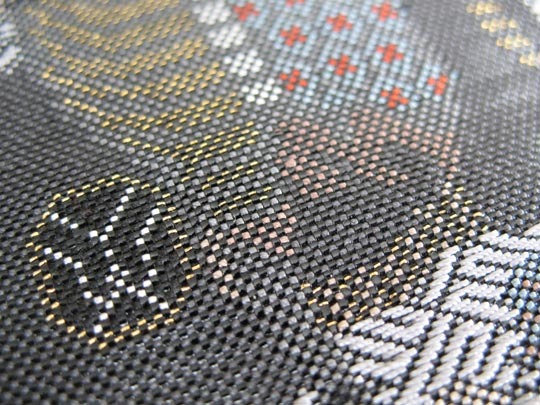 So it would probably be more like 100 – 150 if I were using a tabby weave. Now I understand why obi for kimono are so expensive and difficult to find. 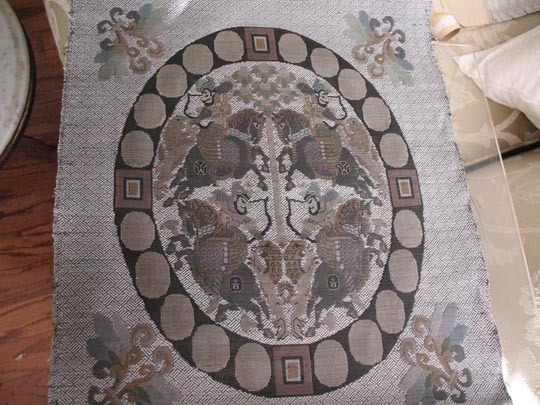 They do show off the weavers’ art in a wonderful way. I swear every time I see a beautifully woven piece I think of you and if you’d ever help if I needed something specific done. You astound me and I’m always enamored of the work you do and pursue. 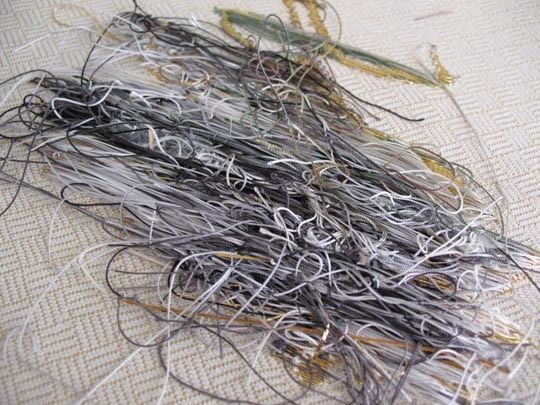 I can help with certain, very specific things – narrow woven bands – I’m not good with anything else yet! Wow these actually made me salivate!! I think might be done in this technique. Surprisingly enough, you can find them some times on Ebay; you need to search on saga nishiki -excel because there is a doll with the same name from Excel which makes up about 80% of the results otherwise. Do you cut the warp yourself, or does it come precut? oh how cool! I have been obsessed with all things Japanese laterly, so this is quite interesting. That is cool enough to make me reconsider my decision not to pick up weaving until I’ve learned every other string art first. That is absolutely gorgeous! In these days of instant-everything, it’s so nice to see people taking time to create beauty. Hell, I have to get my loom complete and get back into weaving! Thanks for sharing, I’ve just drunk these photos up. this is fantastic stuff. looks like you keep the warp connected — how simple. i’ve made paper yarn like this, but the next step is to cut them apart at the ends so they make one long piece. this is then spun as a singles. i’ve made ribbon this way, but i’ve never tried weaving with it. thanx for the great pics. it’s gorgeous. So, why doesn’t the paper tear? Is it because it’s lacquered/leafed or is it the type of paper? 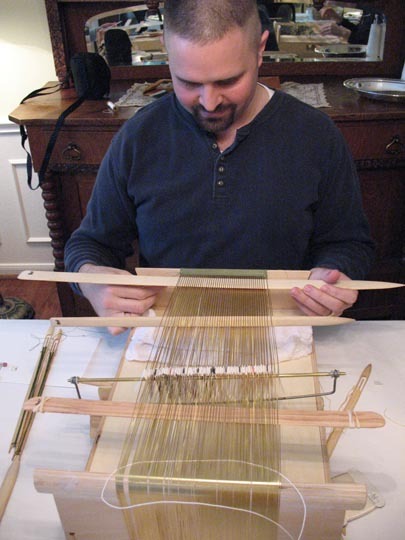 Secondly, where do you find classes like this… it’s awesome, but I can barely find a class on loom woven twill around here! The paper doesn’t tear partly because it’s just strong rice paper, and partly because of the treatment. We did get to see the instructor cut and tear the paper during some of the setup and a fixing of a broken warp. I am honestly amazed that we only saw 2 broken warp strands in the course of a week of seven people weaving. Somebody with my Guild clued me in on this one. I honestly don’t know what to tell you about that! I’m trying to get set up with a weaving teacher; I’m hoping to learn to do a lot of cool loom stuff soon. Great to find a Saga weaver. When and where did you take the class? I took my class from J. Paul; she is a former student of Mihoko’s. This is great stuff and your photos were wonderful. There are so few Saga weavers here in the US. Need to start some type of network for classes, ideas, and supply options. Linda, I took the class in Dallas – she lived here for a couple of years in the 80’s, and got to know a lot of people locally. She’s tentatively planning to come back next year. We talked about Jan’s work – one of the people in the class has a piece of her jewelry. There was one weave in particular that a lot of ‘fans’ seem to want but I figured it would be something you may be able to do. If you want to see it I could provide a photo? Heck, you are amazing at what you do, you constantly amaze me with what you come up with! Sure, I’ll be happy to look at it…. I’ll tell you if I can (or will want to) do it. What I’m curious about is the gold base with the arrowhead red/blue/white design it’s only supposed to be one row. Is this something you’d be interested in or would you need more reference etc? I’m not quite sure how that’s constructed, but it sure looks like it’s a supplemental warp technique plus some supplemental wefts. 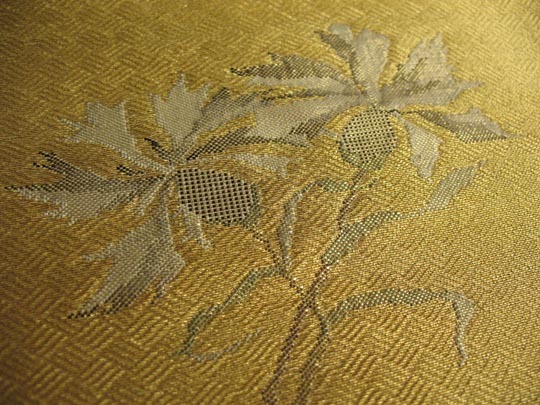 My guess is, that this is about 2 inches wide, woven with fine thread. 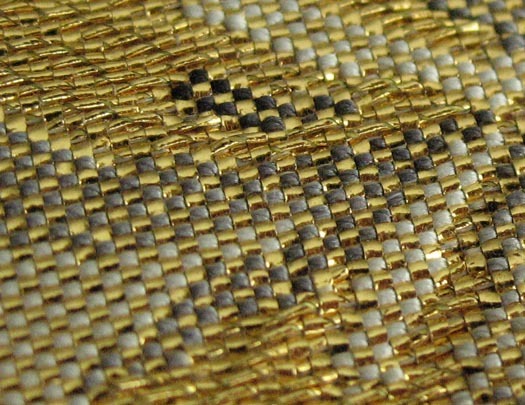 It’s not something that it would be cost-effective or time-effective to do with the tools I use – I could probably get a reasonable approximation after some swatching (the colors wouldn’t all necessarily be put in by the same method, but they would be in the same places) but hand-weaving it would cost several hundred dollars per yard. Ouch, that would be no way since I know none of my customers would pay that much. It’s amazing to realize how much work goes into something like that. Thank you so much for looking regardless it’s greatly appreciated. Part of it, is the fact that a lot of these things are done by machines – even 200 years ago, there were sophisticated looms that took a lot of the tedium out of stuff like this. But now, with computer-controlled Dobby head looms, you can basically start it running and check back in every once in a while to make sure it’s getting along OK. Plus, I don’t do enough volume to justify purchasing supplies in bulk, and I’m not working for third-world wages. I’m sure you understand, doing what you do! What’s the original sample from? Amazing to realize how sophisticated the process has always been I’m very impressed by it all. Oh goodness, no I can completely understand that! I hope you don’t feel I was saying you should work for third world wages at all as your work should be greatly respected since it takes dedication, talent and skill. I was intensely curious since a lot of fans seem to inquire about that particular braid, it always seems to appear as a subject of conversation for those people who want ‘accuracy’. That was from an Admiral’s uniform from Star Trek Search for Spock and a few other films however, I’m not sure where it originated from before that. There were 7 of us in class, and I’ve heard from a couple of others by way of the Internet – maybe we ought to put together a small conversation group on Yahoo or something? 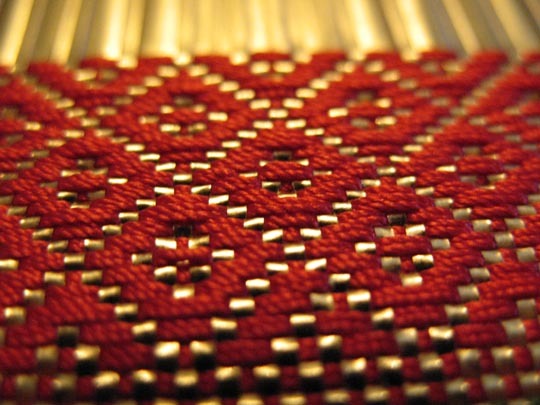 It’s so different from most weaving, it would be great to be able to share ideas and resources. Hi. 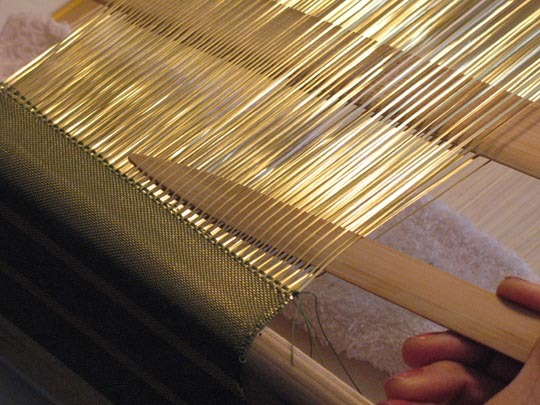 Can you direct me to where to get equipment and supplies for Saganishiki weaving?